Andrew Harrison and I spent a very enjoyable weekend on the north coast of Ireland at Ballycastle Film Festival. On Saturday morning we hosted a 90-minute presentation on doing special effects with little or no money. Using a lot of audience participation, we demonstrated how to produce see-through ghosts, fake punches, meat cleavers in throats, etc. Later in the day we held the premiere of our latest Ballycastle Film Club production, Do Not Disturb, which went down a treat with the audience. Various filmmakers arrived throughout the day, giving talks and showing movies. 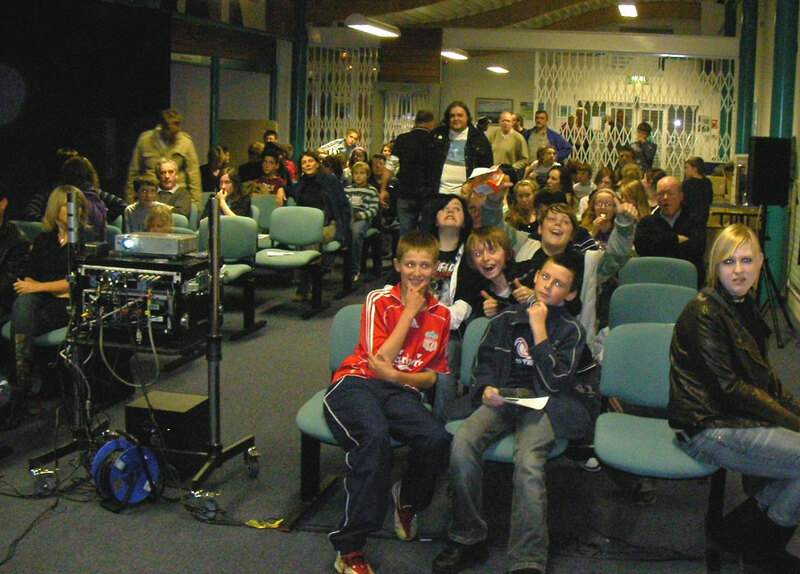 Later in the evening, most of the movies filmed by the club in 2007 were shown, in anticipation of a special award for the Best Film of the Year. Our movie from October, The Siren, won, to the delight of the cast members who showed up. Andrew and I were presented with a fantastic Oscar-style trophy, and all the kids who took part in the movie were presented with a framed certificate. 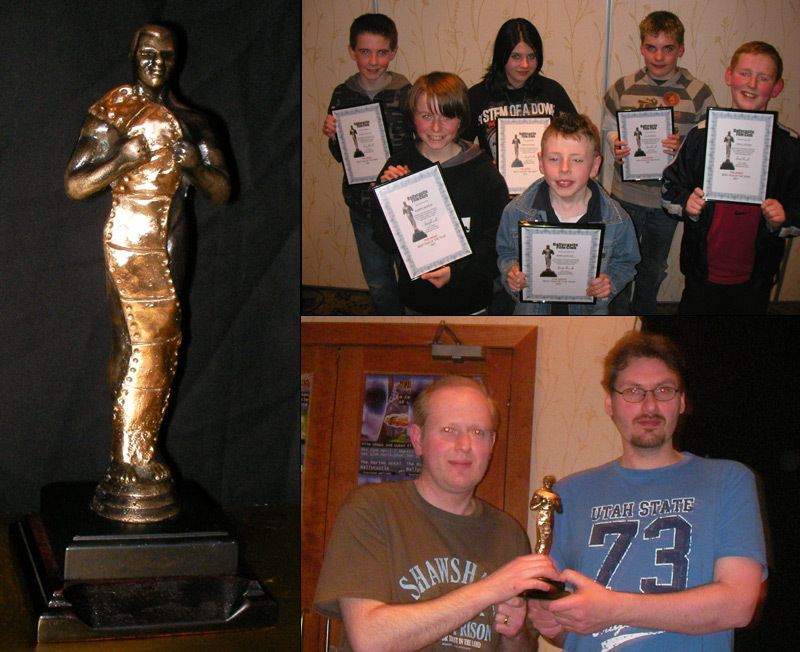 Here’s hoping Ballycastle Film Club goes from the strengh to strength in the future. It’s great that a little seaside town has this activity for young people. On 1 March Andrew Harrison and I headed up to the north coast to make our third film with Ballycastle Film Club. In preparation, my mind had drifted to a memorable short story that I read about ten years ago in the pages of small-press fiction zine RQC (short for Really Quite Cosmic). The story was “Student Seance” by James A. Tucker. I decided to write it as a script from the ground up, without re-reading the original. I wrestled a bit, as a Christian, with a subject matter; it’s difficult telling a fantasy story featuring an occult activity that you believe is genuinely dangerous, but I found a balance that I quite liked. Sadly, I’ve no way of notifying James that we’ve made a movie out of his story, or of even asking permission. But it’s a non-profit movie, and I hope he would be delighted by our choice rather than offended. Maybe he’ll discover the movie one of these days if he Googles his name. At Ballycastle Film Club, I was delighted to see the return of some old faces, as well as some new ones. Do Not Disturb was premiered yesterday evening at Ballycastle Film Festival, and received a hearty round of applause. Hope you enjoy it, too. On Friday evening Andrew Harrison and I travelled up to Ballycastle for the premiere of The Siren, a movie we made a few weeks earlier with the town’s filmmaking club. We had a brilliant turnout – over fifty bums on seats. The film went down a treat, generating a lot of (intended) laughter, and a hearty round of applause. It’s a wonderful feeling to see people get so much enjoyment out of something you’ve toiled over. Philip Henry, the man who wrote the novel on which our movie is based, also attended the event. I’ve corresponded with Phil online for several years, and it was great to finally meet him. Andrew Harrison and I spent Saturday up at the north coast, where our friend Harry Hamill runs Ballycastle Film Club. Nine kids, aged ten to fifteen, showed up, and we filmed a short monster movie that I had scripted earlier in the year: The Siren, loosely inspired by Philip Henry’s novel Mind’s Eye. It was a hard day’s work getting everything done on time, but it was a whole lot of fun – especially watching Emma drag Alex into the freezing cold ocean on his back. Such enthusiasm! We also had a chance to use some excellent cameras, supplied by the Film Club. The photograph (kindly supplied by the Ballymoney Times, who showed up to cover the event) shows Harry, myself and Andrew, with Alex, Emma, Lee and Alanna. If you look closely, you’ll notice the grotesque fingers from Don’t Look in the Attic. Those are actually the legs from a life-size model kit of a facehugger from Alien! Andrew and I will be editing the film over the next two weeks. It will be premiered at a Halloween festival in Ballycastle on Friday 2 November. Right after that, we’ll be sharing it online, of course. Last weekend, Midnight Pictures was invited to travel up north to the seaside town of Ballycastle, to do a one-day filmmaking workshop with the town’s already established Film Club run by our friend Harry Hamill (who stars in several of our own films). Only two people showed up to take part (maybe due to the rain), which meant we couldn’t film our intended story. Nevertheless, Andrew Harrison and I didn’t let that dampen our enthusiasm. A quick scout around an adjacent ruined building got us thinking along post-apocalypse lines. It really was a fantastic location (as you’ll see). And what post-apocalyptic scenario did we choose? Do you really need to ask? Well, for the first time since 1993, Midnight Pictures returns to where it all began … zombies! I’m quite proud of how this movie turned out. We managed to record a complete six-minute movie in the space of five hours, complete with zombie make-up and blood (courtesy of some art paint we found on the premises). I spent yesterday and today editing the movie, and it was a real joy seeing it come together. I was especially pleased with the climactic fight scene, which felt genuinely tense to watch. You know the special effect I’m talking about: somebody walks across the room, and you can see right through them. It’s an easier effect to produce than you might realise. All you need is a tripod and some video editing software that allows you to layer two video tracks on top of each other whilst controlling the opacity level of each (i.e. how much you can see through the image). If that’s a bit of a mouthful for you, let me explain. First, set the tripod up nice and steady. Tighten all the adjusters so that it won’t move during, or after, recording (this is very important). Now, have your actor walk across the room in front of the camera. When you’ve finished the shot, film exactly the same shot without the actor. For editing, I use a great little budget video editor called Serif Movie Plus. After you’ve captured the two shots into your computer, position them each on separate tracks so that they will both play at the same time. Of course, no magic will happen yet; the computer can only play one video at once … until you adjust the opacity level of the shot with the actor so that the shot becomes partially see-through. What do you think will happen to all the bits and pieces of scenery in your shot? Absolutely nothing, becuase the shot behind this shot contains exactly the same scenery. But what will happen to the actor? You will see the scenery through him. You can also experiment with cross-fading the two shots together, which will produce an effect just like the TARDIS taking off or landing. Two other things are important for an effect like this to work. (1) The camera is not allowed to move, so you’ll have to live with a static shot; no pans or zooms. (2) Nothing (except the actor) is allowed to move. You may have trouble filming outdoors if there are plants and bushes blowing in the wind, or moving traffic. Editing on Don’t Look in the Attic is now complete. It’s down to me to get the music composed and to sort something out for the title sequence. After that we’re pretty much done. It has turned out to be around 30 minutes; ten longer than expected – which is good, because I didn’t like the idea of organising a premiere for a mere 20 minute feature. This summer, the plan is to put filmmaking out of my head for a year and knuckle down to writing my second novel. I say this with some hesitation, because I’ve had a few false starts, but we’ll see.